which is in effect from 4 PM Thursday to 1 AM CDT Friday. * Sustained Winds...Northeast gales to 40 knots. 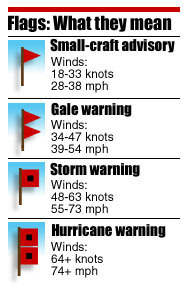 * Wind Gusts...Up to 40 knots. * Waves...10 to 14 feet. There wont be any fishing boats tomorrow and the cargo ships will be rocking. I think I will stay home. That should be interesting to watch! Hope all is safe and we can get some good video of waves rolling in. Thanks for the info Denny. Scary stuff, I pray all of the men and women on the lakes can find safe harbor until calmer times. Salties don't usually salute and the rest don't usually salute between 2200 and 0600 out of courtesy.